"יום עושים טוב בקהילה" בפארק הכרמל, המוחרקה, בארגון ובשיתוף "פרויקט הדגל" של אוניברסיטת חיפה. This year the 6th Annual Haifa Conference celebrated the 50th anniversary of plate tectonics and honors the contribution of Prof. Zvi Ben-Avraham to this field. The Plate tectonics theory revolutionized our understanding of the Earth, thanks to the contribution of numerous researchers worldwide. We are delighted to host their best, from USA, Europe, Africa and Israel. The conference took place at the University of Haifa on November 15-16, 2018. The first day was dedicated to lectures and discussions. During the second day, we have been on a geological tour in the Mt. Carmel area. Volunteering as part of "doing good for the community" day. Recognizing the importance of the empowering and bonding experience between Leon H. Charney School of Marine Sciences and the Ein Hayam community. The 4th academic meeting of the Department of Marine Biology was attended by about 70 PhD and MSc students, postdoctoral fellows, principal investigators, research fellows and scientists. The meeting included lectures by students from every research group. The talks covered a wide range of research methods and fields, from apex marine predators through molecular works on various organisms to marine bacteria. In addition, some 30 students presented their projects in two poster sessions. At the end of the meeting, prizes were awarded to the three best posters and talks. For more details and photos, please see this link. The conference will spread over two days, Nov. 14th and Nov. 15th. The first day, held on the Carmel Campus, University of Haifa, is aimed for the general public, and will include high level presentations. The second day, held at IOLR, Shikmona Campus, University of Haifa, will showcase in-depth technical workgroups as well as live demonstrations of the capabilities developed at the Hatter Department of Marine Technologies. The 2017 Charney School of Marine Science (CSMS) Research Cruise was an orchestrated event that included representative students and researchers from all of the departments of the school: Marine Biology, GeoSciences, Marine Technologies and Maritime Civilizations. Between 07 – 11 May 2017, students and researchers performed a variety of research activities on board the EcoOcean RV Mediterranean Explorer, including ROV seafloor and shipwreck surveys, sediment box core samplings and plankton net tows. During the same week, a suite of research projects focusing on seafloor sediments, benthic megafauna, shipwreck archaeology, underwater photogrammetry and seafloor microplastics were carried out by SCUBA divers in the Rosh Karmel region, led by the Maritime Workshop team at the Recanati Institute for Maritime Studies. From June 11 – 15, a joint team of students and researchers performed a number of deep-sea tasks (mainly ROV surveys and sampling, piston core sampling) from the IOLR RV Bat Galim in the Palmachim Disturbance and in the Akhziv Submarine Canyon. The video, taken in the Aegean Sea, shows the males raising their arms, changing their skin colors and dilating their pupils in a show of strength. 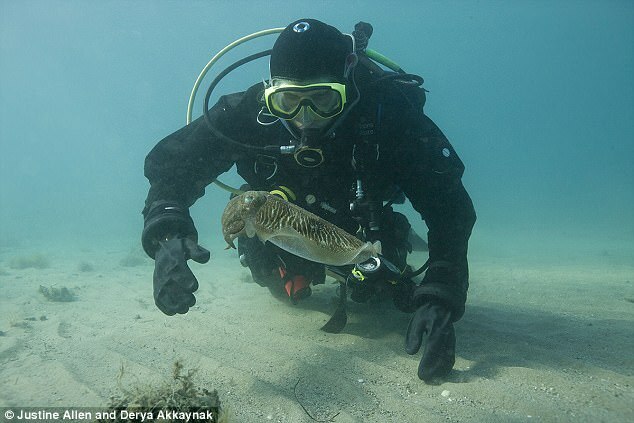 The encounter was filmed by Dr Derya Akkaynak of the University of Haifa in Israel, and Dr Justine Allen, then a PhD student in the Brown University-Marine Biological Laboratory (MBL) in 2011, with MBL Senior Scientist Dr Roger Hanlon. Excavations at the Canaanite palace at tel Kabri headed bt Assaf Yasur-Landau & Eric Klein keeps on yielding surprises. The discovery two years ago of 40 jugs of wine was considered a massive find. This year, no fewer than four more rooms full of jugs have been found. This year the Charney School of Marine Sciences staff and students participated in a voluntary activity within the framework of the "Good Deeds Day" (28/3/17) for the community in the Ein Hayam Haifa neighborhood, in cooperation with the University of Haifa's "flagship project". This was a twofold educational experience incorporating both giving and receiving, on the one hand volunteering and donating to the Ein Hayam neighborhood, and on the other hand learning the narrative history of Ein Hayam. What's the link between a sand grain, Roman settlements, submarine robots, jellyfish, and pirates??? We study all of those and more in the Charney School of Marine Sciences. Every semester the school gathers to an exciting symposium covering the forefront of research in all our disciplines, from biology, technology, geology, history, strategy, and archaeology. Join us next time on May 25, 2017 and listen to short and fascinating talks from our best students, sharing their ideas, stimulating interdisciplinary discussions and initiating trans-tech innovations. Auditorium 101 in the Hatter Student Building, University of Haifa. The Charney School of Marine Sciences conducts a diverse research agenda. This symposium provides a cross-disciplinary platform for: - Presenting research in a fascinating way (8 minute talks) - Sharing ideas across disciplines - Initiate trans-tech innovations Every hour was dedicated to four students and one faculty member. כמו בכל שנה, במסגרת יום המעשים הטובים ורוח ההתנדבות של ביה"ס למדעי הים בשיתוף עם מחלקת הרווחה בעיריית חיפה, נרתמנו לפעילות התנדבותית בסימן עזרה לנזקקים, צביעת חדרי מדרגות וסיוע בטיפוח גינה בבניין מגורים בשכונת בנווה דוד. 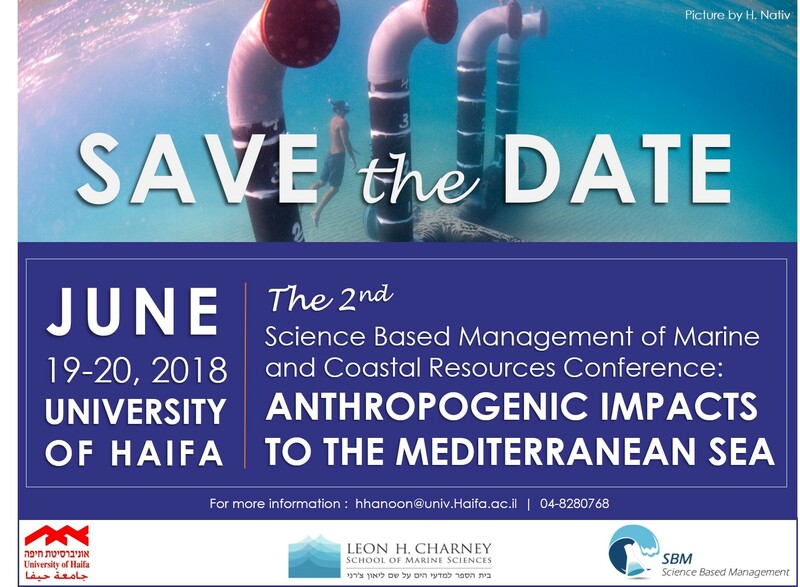 The SBM project - Science Based Management of Marine and Coastal Resources led by Dr. Dan Tchernov, Marine Biology Department, The Leon H.Charney School of Marine Sciences, University of Haifa. The Ecosystem services' assessment in the Israeli Mediterranean project – assessment of the benefits of marine ecological system led by Dr. Shiri Shamir Zemah, The Natural resource and Environmental Research Center, University of Haifa. Leading researchers from Israel and abroad had lectured at this special conference. The annual Conference on the Mediterranean Sea Research is a mutual initiative of the University of Haifa and the Municipality of Haifa. The conference aimed to hold a public academic discussion on the various research issues arising due to the massive marine development along the Meditteranean shores, including natural gas discoveries, setting up of marine infrastructures, preservation of the marine environment, development along the seashore line, protection of historical assets of the sea, maritime economy and maritime strategy. The Eastern Mediterranean is facing a new era of rapidly economic growth, mainly due to the discoveries of world class hydrocarbon reservoirs in the Levant basin. This Symposium providing a podium in which scientists of neighboring countries will be able to discuss scientific issues regarding the broad Marine Sciences discipline in a comfortable ambience, far from regional conflicts and geopolitics. Development of the Eastern Mediterranean hydrocarbon reservoirs requires comprehensive and detailed geological, environmental and archeological surveys for hazard assessment, risk mitigation and conservation of the regional historical heritage, in an interdisciplinary and trans-boundary approach. סינמטק חיפה בשיתוף עם ביה"ס למדעי הים ע"ש צ'רני באוניברסיטת חיפה, חקר ימים ואגמים לישראל ופרויקט "הים שלנו"
במסגרת יום המעשים הטובים ורוח ההתנדבות של ביה"ס למדעי הים נרתמנו לפעילות התנדבותית בסימן עזרה לנזקקים, צביעת חדרי מדרגות וסיוע בטיפוח גינה בבניין מגורים בשכונת המצוקה- נווה דוד. רב הדיירים בבניין זה נכים, קשישים וחולים. הפעילות התקיימה בשיתוף עם מחלקת הרווחה בעיריית חיפה. זו הייתה ההזדמנות שלנו להיות חלק ממבצע מרגש, לתרום לקהילה ולעשות טוב להרבה אנשים. יום המעשים הטובים, פרויקט הדגל השנתי של עמותת "רוח טובה", מתקיים משנת 2007 במטרה לעודד את רוח ההתנדבות והערבות ההדדית בחברה הישראלית. כנס הישראלי השנתי לרובוטיקה ימית 2014 מאגד את קהילת הרובוטיקה הימית בישראל. ייעודו של הכנס הינו להוות מרכז וגולת כותרת להצגת חידושים ומגמות בעולם תוכן ייחודי זה, ויצירת קהילה מדעית בשת"פ התעשייה האזרחית והבטחונית ועולם האקדמיה. כל זאת, לצורך מיקוד, שיתוף ידע, למידה וסיעור מוחות לצרכי מדינת ישראל. במסגרת יום המעשים הטובים ורוח ההתנדבות של ביה"ס למדעי הים נרתמנו לפעילות התנדבותית בסימן ניקיון חופי הים של חיפה. יום המעשים הטובים, פרויקט הדגל השנתי של עמותת "רוח טובה", מתקיים משנת 2007 במטרה לעודד את רוח ההתנדבות והערבות ההדדית בחברה הישראלית.